I got this idea from the Martha Stewart Halloween magazine. She sure loves this holiday. 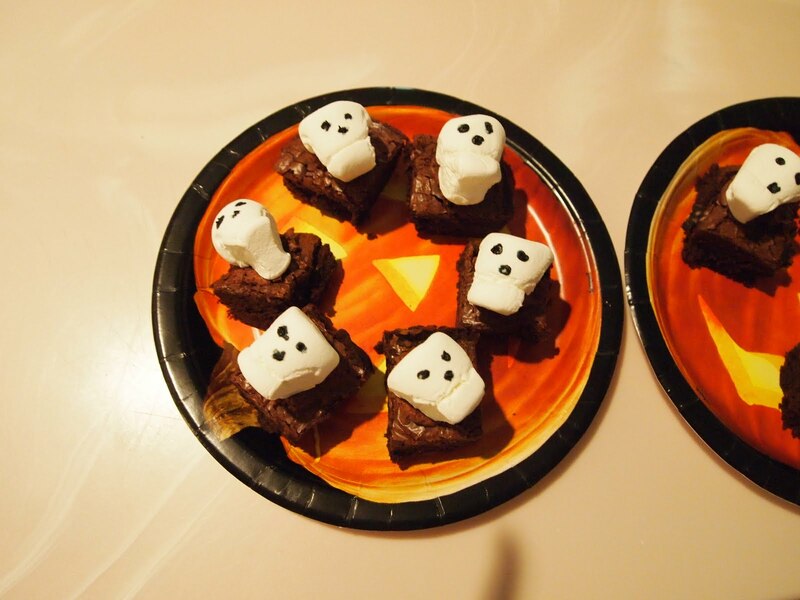 She made them with chocolate madeleines but I opted for brownies without nuts and I fixed the marshmallow skulls on with a bit of chocolate icing. The eyes and nose in skulls are black frosting i put on with a toothpick and actually made a hole. The mouth is a cut and you cut the sides of the big marshmallow with scissors to give it a skull shape. I gave these treats to the neighbor kids, postal carrier etc. We do candy on trick or treat night but these were extra. I think the treating time should always fall on the Saturday closest to October 31 it would make life easier and who wants to go out on a school night? What would we do without Martha? Really cute treats.